Listening to music on noise-cancelling headphones often means shutting out the world around you. While that’s ok in some circumstances, it’s not safe when you’re biking, running, skiing or doing other activities that require situational awareness. 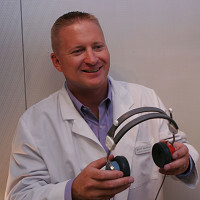 A sophisticated headphone solution aims to solve that problem. The earHero system uses miniature speakers that are tiny enough to fit into the ear canal but won’t block it, which means outside sounds can pass. Users can still hear sirens, horns, and even conversations while they’re listening to music. The system was designed by audiologist Matt Murphy, who went on a ski trip and realized skiers with ordinary headphones couldn’t hear what was going on around them. He started playing with hearing-aid components to create earHero’s tiny units, which have been widely adopted by government agencies and security personnel. Minimalist and comfortable, earHero’s headphones can be worn for long periods without ear fatigue. They fit securely, so you won’t be constantly adjusting them during a run, for example. Noise-cancelling headphones tune out everything but your music. EarHero is different. You can tune into music without tuning out the world around you. About 9 years ago, we were on a ski trip with some friends and everyone had just gotten the new iPod shuffle for Christmas. They were cool, but we found that as everyone was listening to their music, they could not hear anyone or anything else around them. As audiologists, we work with many new hearing devices and thought, "Maybe we could adapt some of what we know to create a new earphone?"... and the result? 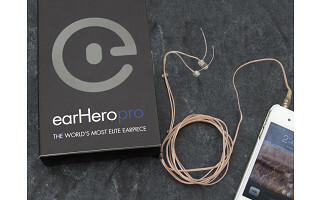 earHero! I am a singer in an a cappella group of 8. we've tried Shure e3s, and we've rejected them.... because of the noise cancelling properties. it sounds like we're singing in our heads, or maybe a bottle, can't hear the audience or our fellow singers across the stage. I keep looking for an alternative. have you had any feedback from singers? Are these resistant to water (i.e., sweat)? So, could they be worn by someone working in the yard, etc? Thanks! @Barbara Hi Barbara. Because the speaker is sealed in sits inside the ear canal it is very well protected from sweat. We wont say they are "water proof" but it would take filling your ear canal with sweat before you had any problems. Great question! I have very small ear canals and have yet to find earbuds which are comfortable, even with soft tips, adapters, etc. Will this work for me? Is there any way to estimate the size before ordering? @Marta Hi Marta, There are some extremely small canals that it just will not fit but I tried to find something common that would help you and saw that a standard paper clip is about the same width so if your canal is at least that wide you should have no problem. As an audiologist I must tell you "don't stick the paper clip in your ear"
I'm interested in your earphones as I like to wear headphones when I'm running. However, between the sweat and snagging cords on stuff, I haven't had much luck in finding earbuds that last much more than a year. $150 is a lot for that type of longevity. What is your warranty plan? @Walter Hi Walter, Aaron from The Grommet here. 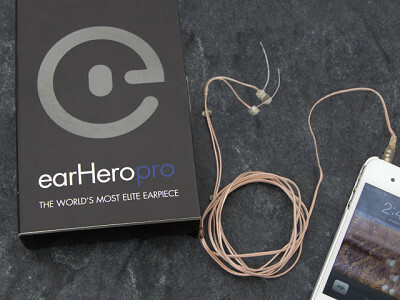 earHero has a Limited 90–day Warranty for defects in the product caused by the material or the workmanship. According to their terms, the"warranty guarantees that there will be no defects [in] the product as a result of materials or workmanship for 90 days from the date of purchase and expires at the end of the 90 days from the purchase date. " Matt specifically designed the earphones for active use (skiing, cycling, running, etc.) and has tested them for durability. Let me talk with Matt and get you a more detailed answer. Have a great night! Hi Aaron and Walter the information provided is correct regarding the warranty. My wife and I have used the same pair for running and skiing for a few years. In addition, we have secret service personnel that have used their earHero's up to 16 hours a day and have had no issues. We do wear our cords on the insides of our shirts and recommend that others do the same. Another option, is to add on our Bluetooth clip (available on our site). With the Bluetooth clip you can keep your phone in your pocket so that the cords don't catch on anything. Hope this helps you make your decision. I work on the Telephone calls for all day long and feel really irritated when i plug earphone after the long day. I even have a serious issues with my ears and the doctor recommented me to not to use ear that often. Does these earphone are effective in these conditions as well ?? Are they safe for me too use because i do you ear phone really often and wanted to know if these ear phones are safe for me as well. Listening to music on noise-cancelling headphones often means shutting out the world around you. While that’s ok in some circumstances, it’s not safe when you’re biking, running, skiing or doing other activities that require situational awareness. A sophisticated headphone solution aims to solve that problem. The earHero system uses miniature speakers that are tiny enough to fit into the ear canal but won’t block it, which means outside sounds can pass. Users can still hear sirens, horns, and even conversations while they’re listening to music. The system was designed by audiologist Matt Murphy, who went on a ski trip and realized skiers with ordinary headphones couldn’t hear what was going on around them. He started playing with hearing-aid components to create earHero’s tiny units, which have been widely adopted by government agencies and security personnel.